The survey & valuation industry continues to respond enthusiastically to widespread adoption of digital technology, with positive feedback coming from stakeholders at a number of surveying events during the early part of the year. It’s clear that automation of previously manual processes has brought significant benefits to lenders, surveyors and intermediaries alike, and lenders who’ve already invested in technology will be looking to their supply chain to follow suit if they’re not already on board with the digital revolution. Technology has brought about significant improvements in professional standards across the industry, this is providing stakeholders with increased confidence in their governance and due diligence. Having a robust audit trail is a vital element of the surveying journey, and of note at January’s events was feedback from auditors who are reaping the benefits of digital solutions. 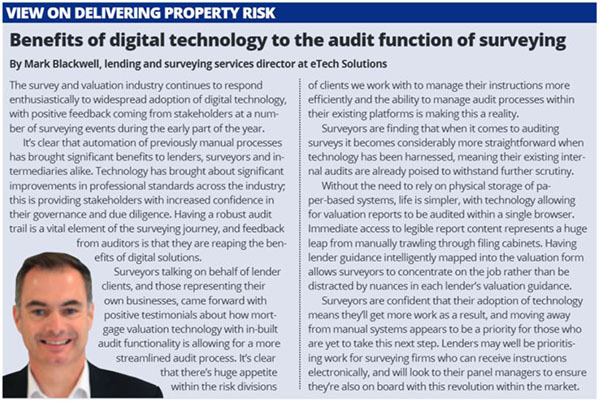 Both surveyors talking on behalf of lender clients, and those representing their own businesses, came forward with positive testimonials about how mortgage valuation technology with in-built audit functionality is allowing for a more streamlined audit process. It’s clear that there’s huge appetite within the risk divisions of clients we work with to manage their instructions more efficiently and the ability to manage audit processes within their existing platforms is making this a reality. Surveyors are finding that when it comes to auditing surveys it becomes considerably more straightforward when technology has been harnessed, meaning their existing internal audits are already poised to withstand further scrutiny. Without the need to rely on physical storage of paper-based systems, life is simpler, with technology allowing for valuation reports to be audited within a single browser. Immediate access to legible report content represents a huge leap from manually trawling through filing cabinets, and having lender guidance intelligently mapped into the valuation form allows surveyors to concentrate on the job at hand rather than becoming distracted by nuances in each lender’s valuation guidance. Surveyors are confident that their adoption of technology means they’ll get more work as a result, and moving away from manual systems appears to be a priority for those who are yet to take this next step. Lenders may well be prioritising work for surveying firms who can receive instructions electronically, and will be looking to their panel managers to ensure they’re also on board with this revolution within the market. Find out more about eTech’s Survey Hub.